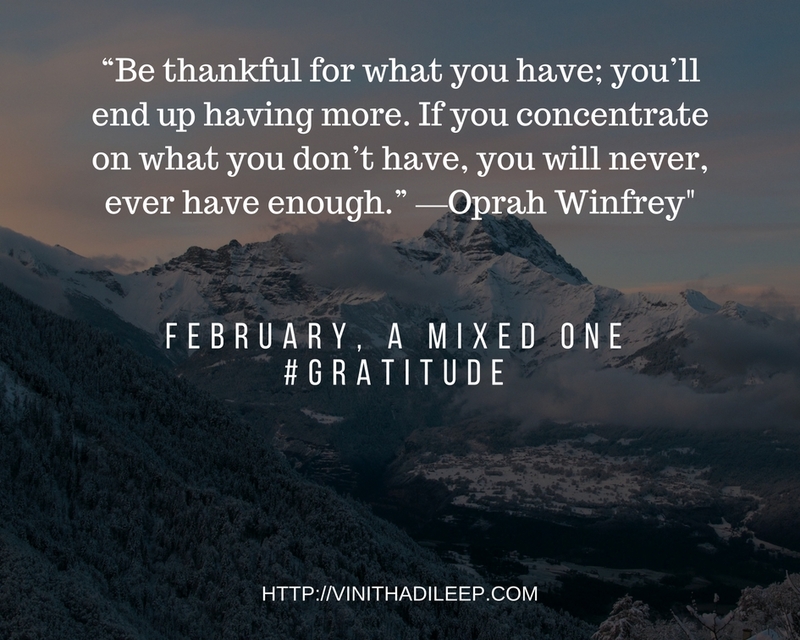 February, a mixed one #Gratitude - Reflections..
Take deep breaths. That’s what I tell myself all the time. But, that’s what I forgot to do this month, to take deep breaths. Funny, isn’t it? I was bogged down with the imaginary schedules and work and stress, which created undeniable stress that followed me around all through February, which by the way hasn’t taken its leave, though February is almost over. I wasn’t able to tackle my problems because there weren’t any, other than the ones swarming in my head. I was in a race with myself, to catch up and accomplish, but I never could finish the race because it was unreal. And there wasn’t any need to do so. But I struggled, pushing myself down time and again. There were moments, short ones when I realized that I had to take a break and catch a breath or two. But that sense of calmness never persisted. Today, when my little one went down on his nap, I started to eat my lunch and you know what, I was rushing through my meal. I wasn’t enjoying. I forgot to savor those bites and just be in the moment and enjoy the experience. I realized then that this was what I was doing all these days – forgetting to enjoy and be in the moment. There is no fun in rushing to the end. The journey is the fun part. While I was trying to keep up with my goals, I wasn’t enjoying, rather torturing me in the process. Plus, I was adding tasks after tasks to finish up. Above all, I wasn’t appreciative of myself. February imparted an important lesson, that is, I’m important. I, just the way I am, am important. And that before I go seek approval from others I need to give approval to myself to be who I am. Of course, I’m not perfect, but if there is one thing I can’t live without in this world is ME. My essence, my principles, my peace, my calmness, my happiness, these are all valuable to my existence. So I need to treat myself with kindness and compassion, not as a deadline. I’m grateful for this late bloomed wisdom, in the hope that I wouldn’t commit the same mistake twice. That being said, I shouldn’t forget the happy moments that February gifted me with. We made a trip to Las Vegas to meet with a few friends. It was nice to catch up after a long time. Kids also had a great time making new friends. Grateful for the company of nice friends. Reading with Kanna is something I enjoy always. We are reading Nancy Drew Mysteries now. Such happiness! My passions – yoga and writing. Though I wasn’t able to practice yoga for solid half an hour, I did make it to the yoga mat every day at least for a minimum of ten minutes and on some days thirty minutes. Yoga sessions however short they are, always leave me with happiness and gratitude. I didn’t stick to the blogging goals, neither did I write a whole lot as planned at the beginning of this month. But whenever I wrote, I wrote with passion. I know that blogging and writing is something I don’t want to leave behind and that I want to get better at. Grateful for these two blogs of mine. My family. They are the ones constantly putting up with my tantrums, which are plenty of late, without many complaints. Oh, they are no saints, but I am grateful than ever that I have a dependable husband and a reliable eight-year-old (Let’s just leave the little one out of this, he can’t be trusted with my mood swings yet). New phone. My old one was constantly running out of charge so much so that I had to charge four to five times a day. It’s been only a couple of days with the new phone, so far I love it. That’s how my February went by. How was yours? That sounds like a good February.. I believe a short break is always good to enjoy life. You are so right. Being in the moment is everything. Hope your new found wisdom will give you less stress in the coming months. I love your point, that most of the stress is imaginary–in our minds! I have had a similar February, stressed and rushed out of my mind . . . and you’re right. Most of it is in my mind. When I calm down and just DO IT, I find I have plenty time to get through everything. 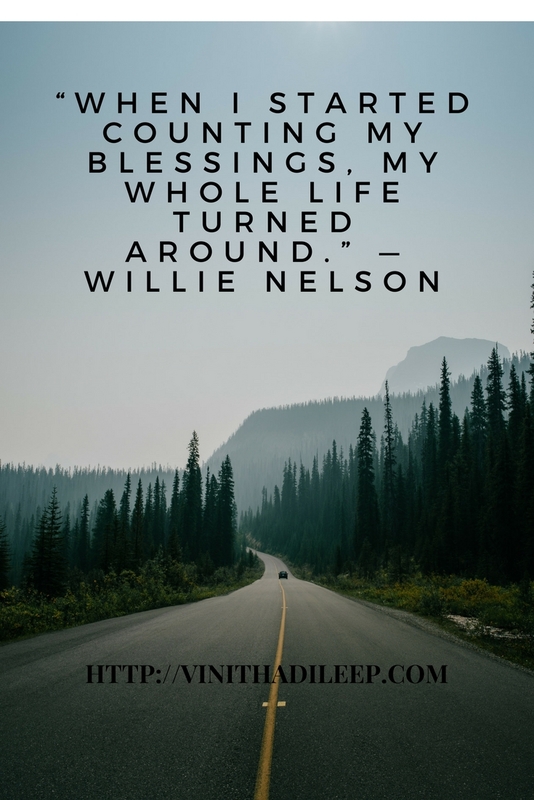 I’d love you to join this post to my Thankful Thursday linkup! Thankful Thursday Week 8 and Write a Catchy Headline! Oops! That should say Week 9! You know that line, about the ‘I’ being valued and loved for life, that’s what I need to remember, ALWAYS! It just slips out of my mind so often and then I end up thunking rather badly abut myself. And, if I don’t think well about myself, who will? I am glad you wrote this. It’s honest, stark and authentic. I like the fact that you realised the need to be mindful and be happy come what may. We all need that affirmation daily. Be happy. Wishing for a better March for you, Vinitha. Ah the break sounds lovely Vini – just what one needs to change the humdrum of routine and have some fun! I am glad you are giving into indulging yourself more and paying attention to your needs! More power to you on that and hope march brings oodles of bliss!!! Such a lovely February Vinitha. Becoming aware is the first step to attaining what is meant to be. I am glad you have become aware of it. This is such an heartfelt post and I must say I saw glimpses of myself there. Wishing you a great March ahead. I am glad you wrote this down. More an your readers, you need this post. It’s honest and a message that will stay with you, Vinitha. There is one thing that I tell myself if I worry on something – will this matter 3 years from now? If no, I move on. Good to know about the LV trip. Must have been good. Take care and keep writing whatever you want. No pressure. Hugs and have a lovely month ahead!